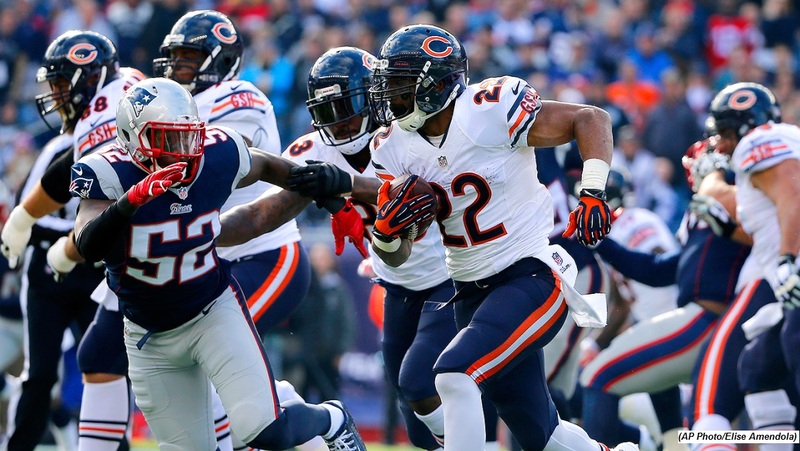 The beleaguered New England Patriots run defense turned in a better performance in Week 8 against the Chicago Bears. The game plan for the Bears was clear – run at the Patriots. Early on, New England was stout, allowing the offense to open a large lead. In this three-part series, Brian Filipiak will show the issues have not been solved but progress is being made. One of the problem areas for the Patriots run defense in Week 7 against the Jets centered on the failure of the linebackers to move laterally, keep off blocks for as long as possible, shedding them when required and then plugging the running lanes. While the Patriots ground game defense still had its share of breakdowns against Chicago, the performance of the linebackers indicate some lessons were learned. The Bears have 11 personnel on the field with wide receiver Brandon Marshall (#15) aligned tight to the formation on the left. With three wide receivers on the field, the Patriots counter with their nickel defense in a 4-2 alignment with defensive end Dominique Easley in a two-point stance on the line of scrimmage. Chicago runs an inside zone play with a little trickery at the snap via motion into the backfield from wide receiver Alshon Jeffery. The Bears have Marshall pull across the formation to provide Jeffery with a faux lead blocker. 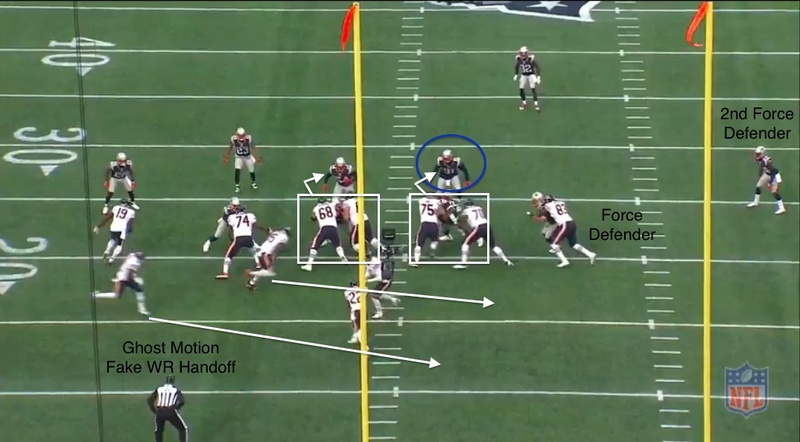 The motion is important because it appears to draw defensive end Rob Ninkovich’s attention as he abandons outside leverage (contain) and shoots to the inside of the blocking tight end. It’s also possible, since cornerback Darrelle Revis is on an island to the right, Ninkovich has the freedom to shoot the C gap and relinquish contain duties to the secondary force defender. 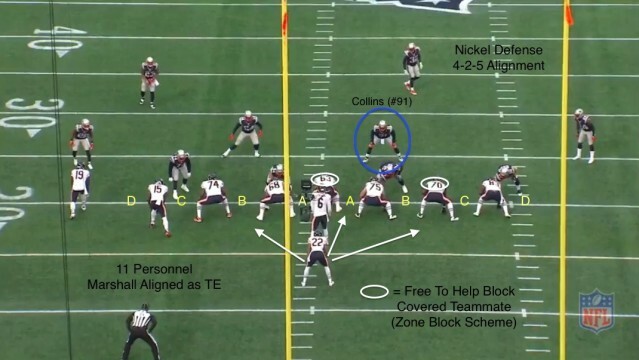 He also knows that the right tackle (#70) will likely work a double-team block (if zone blocking) on defensive tackle Vince Wilfork or move to the second level for a block on the linebacker (if man blocking). Either blocking assignment allows a free lane to the backfield as long as Ninkovich can beat the first step of the blocking tight end. Before proceeding, a related side note is needed. As mentioned, this turns out to be an inside zone run play by the Bears, i.e., the ball carrier’s point of attack will be a hole somewhere between the tackles (inside) and the blockers will utilize double-team blocks (zone) where necessary. The double-team blocks are determined pre-snap by the uncovered offensive lineman as they are coached to aid their covered teammate on a block. Then, depending on leverage, one of the blockers will peel off to the second level to complete the combination block on the nearby linebacker. The threat of the combination block often puts the linebackers in a difficult situation, especially when they look to plug/fit a gap. The offensive linemen in a double-block want the linebacker to flow toward them (about a yard) before moving off the block to engage the defender. This is why it’s important for linebackers to balance aggression (move with play-side action) with patience (plug gap once ball carrier starts to commit). If vacuumed too far into the blocking action, the linebackers become easy prey for second level blockers. 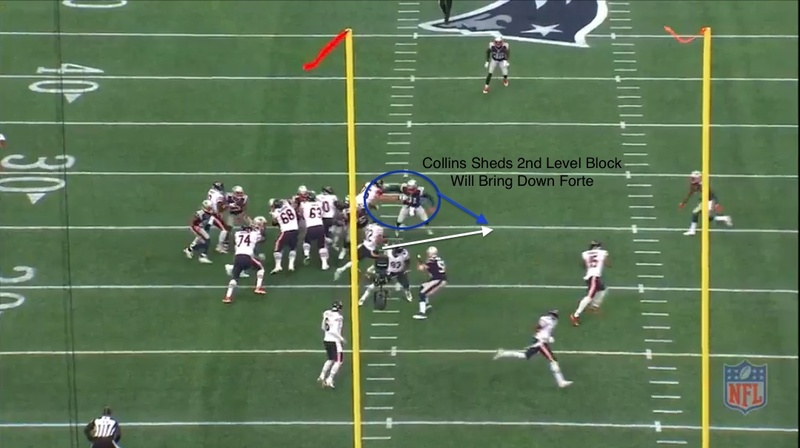 As the inside zone run develops, running back Matt Forte presses hard toward the C gap but reads that safety Patrick Chung has positioned himself in the running lane. Forte now shifts focus to the back-side of the play where he hopes the post-snap motion into the backfield has caused disruption and created a cutback lane — and it has. As seen in the still shot above, Ninkovich has put himself in a precarious situation, sealed off from behind by the tight end and in front by the crack back block of Marshall. Conversely, linebacker Jamie Collins puts himself in a much better position by not getting sucked into the pile of bodies in front of him. By not overcommitting and then correctly reading the ball carrier, Collins has given himself adequate space between he and the approaching right guard. With a quick shuffle step to the right, Collins fends off the block, plugs the cutback lane and brings down Forte. If Collins is not in position to fill the alley, Forte will sprint down the middle of the field for a big gain. Patience in a sea of action is not instinctual; the urge to move toward the ball is built into defenders, but the ability to move laterally and flow to the proper position is essential to effective run defense. Aggression can leave a linebacker out of position or in the path of an oncoming blocker, so diagnosing the play and then reacting is the proper technique. 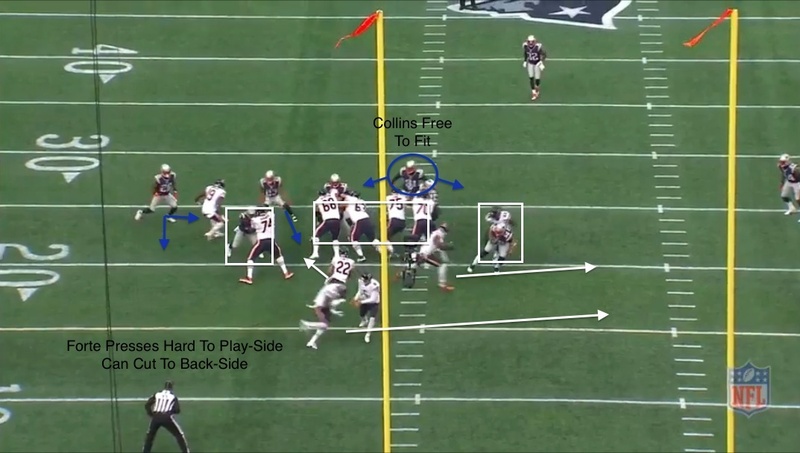 In Part 2, the Patriots ground game run support responsibilities extend beyond the linebackers and into the secondary, in the form of run blitzes and proper play reads.